In her debut feature film, writer/director Angela Garcia Combs spins a dark and funny tale of an ambitious young woman at a crucial turning point in her career and her relationship with her bi-polar mother. Louise (Julia Garcia Combs) is an insurance underwriter living in Los Angeles with her mother, May (Karen Black), who has recently been evicted from her Section 8 apartment after the building was condemned. May's shaky grip on reality begins to loosen when she becomes aware of the close relationship between Louise and her trailblazing boss, Catherine (Barbara Bain), whom Louise admires and adores. Catherine is secretly fighting cancer and has an estranged relationship with her own daughter, and reaches out to Louise as a surrogate. At the same time, Catherine is pushing Louise to accept a big promotion, which will compel Louise to relocate to New York. 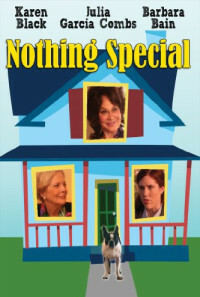 Things heat up when May and Catherine meet by chance on Mother's Day and an alarming confrontation ensues. Throw into the mix a budding romance between Louise and the local bartender, and we find ourselves in the midst of a gripping story of the joys and heartaches of mother-daughter relationships, and the intense emotional lives of three remarkable women living in the shadow of the Hollywood sign. Regions are unavailable for this movie. Click the "Watch on Netflix" button to find out if Nothing Special is playing in your country.